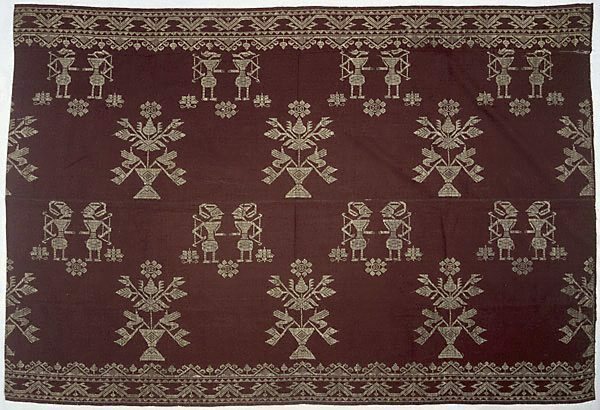 This textile follows the format of more elaborate Balinese skirtcloths or hangings ('saput songket / kampuh songket'). It is decorated with a repeated motif of paired figures standing in profile holding an archer's bow, interspersed with a large floral motif. The motif of figures in the distinctive wayang 'kulit' or shadow puppet style probably draws its imagery from the Hindu epic, the Ramayana. 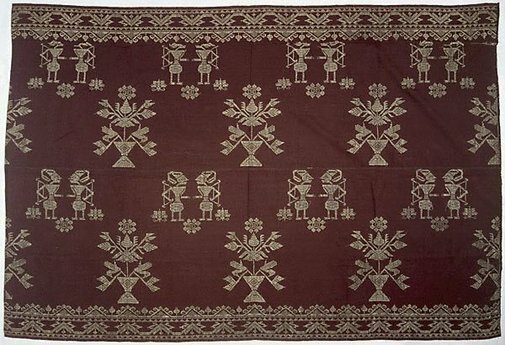 Textiles of Southeast Asia : tradition, trade and transformation , Canberra, 1990, 188.